To reduce the impact our business has on the environment, IKEA constantly strives to use natural resources as efficiently as possible. 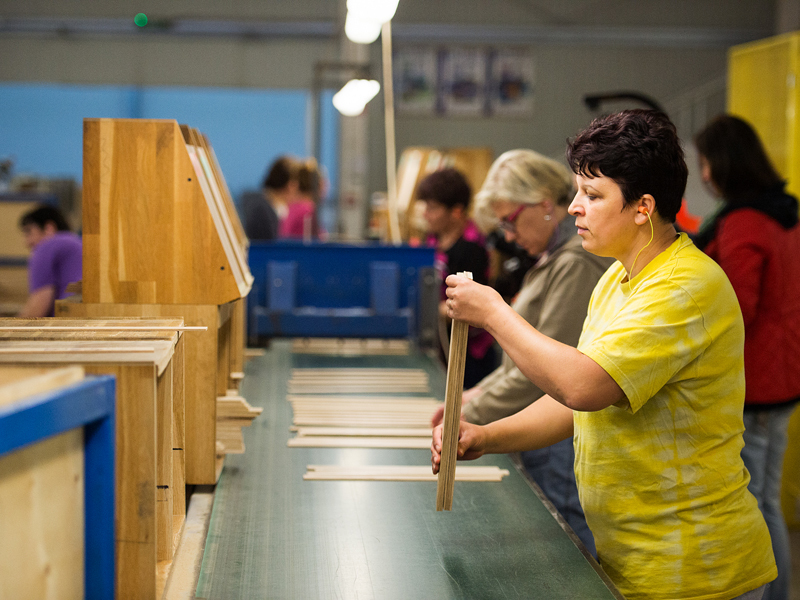 Together with our Romanian supplier Aviva, we’ve developed a new material called engineered wood which enables us to reduce wood consumption by more than 60%. Wood is the primary material for many products. In order to reduce the impact of the environment it is essential to get more products out of each tree. IKEA has worked very hard on this for many years. Engineered wood is one of the most recent inventions linked to this agenda. It consists of a particleboard core layer and a solid wood top layer. When making furniture with engineered wood the entire tree is used – as opposed to around half of the tree in solid wood production. Quality is also improved since engineered wood handles humidity better than solid wood. The idea behind engineered wood came from Aviva in 2007. “Engineered wood was the solution to a problem; the quality of the wood we bought was decreasing at the same time as prices were increasing. We wanted to make more furniture with better quality, but with less wood,” says Boaz Nevo, part owner of Aviva. It took about five years of product development before the first product made of engineered wood, ÅKERBY worktop, reached the market. “One of the challenges was to make the edges look like solid wood. Initially, we made worktops of engineered wood without end grain edges, but they were not well received by the customers,” says Boaz Nevo. Today, the edges have a solid wood look and Aviva uses engineered wood to produce the kitchen and dining worktops MÖCKELBY, MÖRBYLÅNGA, STENSTORP, MÖLLEKULLA and KARLBY. The material is available in several styles with a variety of wooden patterns. More styles are continuously being developed. The ambition is to expand the use of engineered wood to a wider range of products, such as living room and bathroom furniture. “I'm a person who constantly seeks new challenges and ways to expand the business. I want Aviva to be the world leader in engineered wood, and to continue being a great workplace for people in the surroundings of Sighetu Marmatiei,” says Boaz Nevo. IKEA supported the development of engineered wood at Aviva through loans for new machinery and through knowledge sharing. In the future IKEA wishes to extend the capabilities of the current engineered wood production technique, such as forming chamfered and wavy edges, as well as oval and round shapes. “Engineered wood enables us to produce worktops using 60% less wood. It’s a great invention that fits perfectly with our lightweight agenda,” says Cristina Mihaela Nedelea, business developer at IKEA. Engineered wood enables IKEA to use the entire tree, including the branches, while solid wood only uses the trunk. When making worktops of engineered wood, the trunk is used to create the solid wood top layer and the branches are used to create the particleboard inside. While engineered wood has the same look and feel as solid wood, it weighs 20% less. This makes transportations approximately 5% more efficient, which reduces CO2 emissions. Furthermore, engineered wood decreases wood consumption by more than 60% compared to solid wood worktops.